Some people think that tarts are only sweet dishes (lemon tart, pecan tart, etc.) but tarts can be savory too. A tart is basically just an open pie shell with a filling in it. 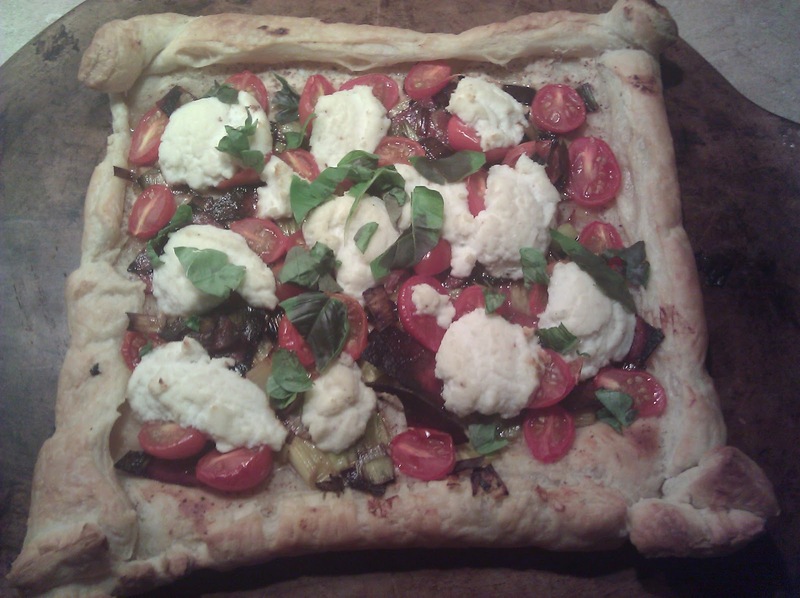 If you have basic ingredients on hand, you can quickly throw together a tart for dinner. I like to use puff pastry for my tarts. Puff pastry is made by repeatedly folding layers of butter in between dough. As the pastry heats in the oven, the butter releases steam, which causes the many layers to puff up. The result is a buttery, but airy crust. Frozen puff pastry is available in the freezer section of the grocery store and is really easy to work with - you just need to let it defrost in your refrigerator and keep it cold until you're ready to work with it. The tart gets baked for about 20 minutes at 400 degrees until it's puffed and golden. If adding any fresh herbs, such as basil or parsley, I wait until the tart is out of the oven, so the herbs stay fresh and vibrant. Next time you're at the grocery store, grab some puff pastry, cheese, and vegetables to create your own quick and easy tart for dinner. Once you make one, you'll see how simple it is and how many different combinations of toppings you can use. Enjoy! Wow love the blog.. Great ideas! I am coming here for my next meal adventure.